Phil Mickelson set-up a possible 50th pro career victory with a blistering 65 on day one of the AT & T Pebble Beach Pro-Am. The 48-year didn’t miss a fairway in managing seven birdies on the Monterey Peninsula course and again, one of three courses hosting the event. 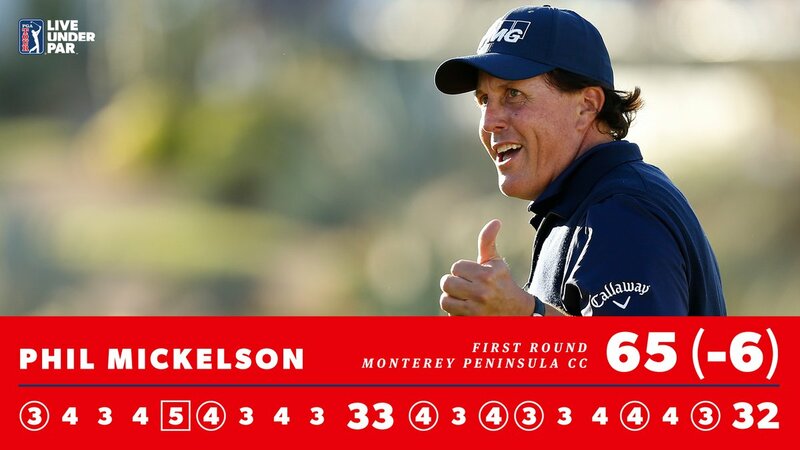 Mickelson, and a four-time winner of the event, ended the round sharing third place at six-under par and just a shot back of the leading duo of fellow Americans Scott Langley and Brian Gay who each shot 64s also at Monterey. The heavy rain of the past week ensured that all players competed under a ‘preferred lie’ rule and with 85 players in the now 155-player field breaking par. In a big shock defending champion, Ted Potter Jr posted a horror 10-over par 82 at Spyglass Hill. In contrast to Potter Jr, Mickelson was naturally delighted with his efforts and in an event he’s been attending since 1995. “History was made today,” Mickelson said boldly. “To the best of my knowledge, it’s taken me 27 years and a few months to hit all fairways in a single round in competition. I may have done it before, but I don’t ever recall doing it. “It was a really good solid round, good solid start, and we had beautiful weather and the golf course here is in spectacular shape. I think that one of the rules changes that came about where you can fix some areas of the green that were caused by other players made a big difference in this tournament for everybody, because around the hole you can smooth out some of the spike marks and indentations. Mickelson won the AT & T first in 1998 and then again in 2005, 2007 and for fourth occasion in 2012 and with that vitory now seven years ago very special for Mickelson as he revealed. “There’s a few things that within our family that go back to this place where my grandfather grew up here and he was one of the original caddies in the caddie group,” he said. Phil Mickelson captures a fourth AT & T Pebble Beach Pro-Am trophy in 2012. In fact, Mickelson contested his first U.S. Open as a then amateur in 1990 and has been runner-up on now fewer than six occasions and with the last being in 2013.